Lawmakers around the country are beginning to take action to reduce the impact of childhood trauma—and the toxic stress it creates—on lifetime outcomes, particularly in education and health. The legislation being considered in Vermont to integrate screening for childhood trauma in health care, as reported recently on this site, is still percolating in the legislature. Another bill (H. 3528) being considered in Massachusetts seeks to create “safe and supportive schools” statewide. 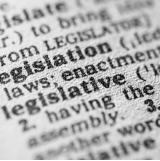 House Resolution 191 — which declares youth violence a public health epidemic and supports the establishment of trauma-informed education statewide — passed in Pennsylvania last spring and was ratified by the National Conference of State Legislatures (NCSL) at its annual meeting in August. According to APPI co-project manager Christina Hulet, the legislation has provided an important framework for the initiative to convene public and private entities to achieve collectively what individual partners could not do on their own. This is “the gold” of APPI, according to Hulet. While the evaluation design focuses on strategies to achieve better outcomes for children and families, it also seeks to document how costs are avoided or saved by ACEs mitigation. This is not a surprising objective at any time for cost-conscious states, but does reflect the budget-cutting environment of the 2011 legislative session when the bill passed. The Vermont bill—first in the nation to call for the integration of screening for adverse childhood experiences in health care—cleared the House Health Care Committee by a vote of 9-2, but died in the Appropriations Committee. When a health care reform bill, S. 252, passed the Senate and was referred the House Health Care Committee, ACEs language was added back into the bill. While S. 252 still has to clear both the House Ways and Means and Appropriations committees, physician legislator and lead sponsor of the original ACEs bill (H. 762), Dr. George Till, thinks the health care reform bill containing the ACEs language has momentum since it is about “the future of the health care system in Vermont.” The ACEs provisions in S.252 are the same as those in the version of H.762 described in an earlier ACEsTooHigh article. The Vermont legislature is due to adjourn May 9, as long as it passes the state budget before then. The Massachusetts bill, H. 3528, would require all schools to develop action plans for creating safe and supportive schools, creates a commission on statewide implementation, and provides technical assistance to help schools and districts achieve safe and supportive schools. Massachusetts along with Washington State is often identified as a leader in the trauma-sensitive schools movement. By providing a framework for schools to create a culture to support all students, the bill offers a model for schools around the country as described in an April 1 letter to the editor in the New York Times by Susan Cole, director of the Trauma and Learning Policy Institute, a program of Massachusetts Advocates for Children and Harvard Law School, and Harrison Polans, a clinical law student in the program. The advocacy site for the bill provides a range of materials on the bill including the legislative text, a brief summary of the major provisions, and an op-ed by the then-sponsor of the bill, Katherine Clark (now a member of the U.S. House of Representatives). In the U.S. Congress, a bill entitled the Mental Health in Schools Act (H.R. 628 and its companion bill in the Senate, S. 195) would authorize $200 million to expand the Safe Schools/Healthy Students program nationwide to provide more students with the benefits of on-site mental health services. It would help schools recognize behavioral health problems in students and make referrals. The intent of the legislation is to require a comprehensive school mental health program that assists children in dealing with trauma and violence. Another bill, Safe Schools Improvement Act (H.R. 1199, S. 403), is more narrowly drawn and directs states to establish policies to prevent bullying and harassment. Pennsylvania House Resolution 191, passed in April 2013, declares support for a public health approach to violence and statewide trauma-informed education. It expresses the sense of House and provides a framework for dialogue on the issue in the media and with community groups, according to Tim Scott, staff of Rep. Ronald Waters (D-PA), the bill’s originator. Scott said it also provided a vehicle to take the issue to a national stage by securing approval by the NCSL, an action that is communicated to members of Congress and the President. The National Black Caucus of State Legislators also approved the resolution. Dr. John Rich, Chair of Health Management and Policy at Drexel University School of Public Health was quoted in an advocacy pamphlet developed to persuade NCSL members to support the resolution that “H. Resolution 191 is a groundbreaking step in acknowledging the impact of trauma on those who have experienced or been exposed to violence, whether in combat or in their own neighborhoods.” While the resolution does not authorize and fund new programs or mandates, it sets an aspirational goal endorsed by one body of the legislature (the Senate has not passed a similar resolution). A final point that I would like to make is that violence prevention is not just about identifying high risk youth or communities, or running “interventions” that will cure the problem. It is about providing families with the tools to parent well and lead well, and to decrease community-level and individual-level stress. Neighborhoods that have a sense of empowerment and self-efficacy will be most successful because they don’t solely rely on police and city agencies to repair and rebuild and protect. It is only in support of multi-level efforts, and recognizing the strong contribution they can make to the public’s health, that hospitals and medical centers will demonstrate that they care about the community rather than just caring for the community. Social worker Dr. Betty Lee Davis also testified at this hearing and two years earlier before the Pennsylvania House of Representatives’ Education Committee’s Informational Meeting at Temple University. It was at this July 2011 hearing that she presented what became the clinical underpinning of the resolution, based in part on findings of the CDC’s Adverse Childhood Experiences Study, conducted by Dr. Vincent Felitti and Dr. Robert Anda. Davis says she was awakened to the impact of trauma on health when she heard Dr. Felitti speak in 2007. In making the case before the Pennsylvania Assembly legislators, Davis chose to describe the impact of children growing up in violent communities as “shell shock,” a medical condition experienced by soldiers in war zones, not unlike many of the streets in Philadelphia and other American cities. She also pointed to the 2001 Report of the Surgeon General on Youth Violence that identified violence as a public health epidemic. Support universal, safe quality education for all. She knows that the cost of programs must be addressed up front, but says that a broad view of the financial impact—considering costs and well as savings in both the short- and long-term—is the measure to be taken. She gave the example of the type of studies conducted by the Institute for Economics and Peace, an international non-profit think tank, which measures both the benefits of peace and the costs of violence. Davis’ clinical experience informs her perspectives on broad policy issues. She supports universal screening but knows that it must be carefully designed and administered by trained personnel. She has seen a huge burden lifted when young people are finally asked about the trauma they have experienced but she also knows the situation is delicate and re-traumatization is a risk. She would like to take the experience she has gained during a long career in the trenches and apply that experience in the public policy arena to support trauma-informed education, reduce violence and end racism. The most recent state legislative body to address trauma-informed care across sectors was the California Assembly Select Committee on Delinquency Prevention and Youth Development at a hearing held April 4 in Los Angeles. ACEsConnection founder and editor, Jane Stevens, testified at the hearing on a range of successful trauma-informed programs in education, health care, and justice, among others. Dr. Steve Wirtz, chief of the Violent Injury Surveillance Program, California Department of Health, presented testimony on the results of the recent Behavioral Risk Factor Survey (BRFS) ACE questions. He reported survey findings on California at the hearing that are similar to those in other states: Childhood trauma is common; extreme trauma tends to cluster together to produce cumulative impacts; and poverty increases the negative impact of trauma. The release of the full report of the BRFS findings is expected in early May. These hearings and legislative proposals reflect a growing awareness that there are promising trauma-informed public policies ready for implementation. Dr. Gabor Mate ( Canadian Physician ) would be helpful in helping to inform your policies. Dr. Gordon Neufeld ( Canadian Internationally sought after Psychologist ) would help with your supporting the families ( the roots ). Best of luck ! Thank you for this well researched article. It is really helpful to all of us working in the policy arena to know what is going on across the country. 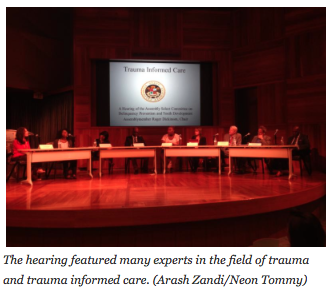 Thank you for sharing this detailed report on trauma-informed public policies. It is hopeful and we need to keep speaking out on mental health issues.